Caedmon (pronounced Cadmon) Records specialised in spoken word recordings. Caedmon albums still command attention due to their eye-catching sleeve designs and illustrations which go right back to the start of the modern vinyl album era. The label was begun in 1952. Two young literature loving ex-college women, Barbara (working at a publishers) and Marianne, had started work in New York but kept in touch. 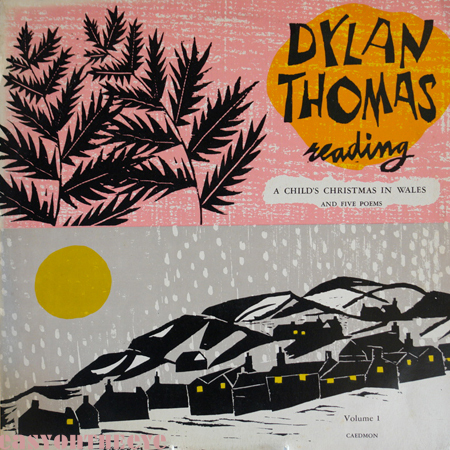 Discovering that Dylan Thomas was due in town to deliver a couple of recitals, they wondered if it would be possible to get him to record a reading for them with a view to releasing it. Despite Thomas’s wayward nature, they succeeded. Lawrence Olivier was also in New York, and they persuaded him to make a recording the same day. The first two Caedmon albums were born. 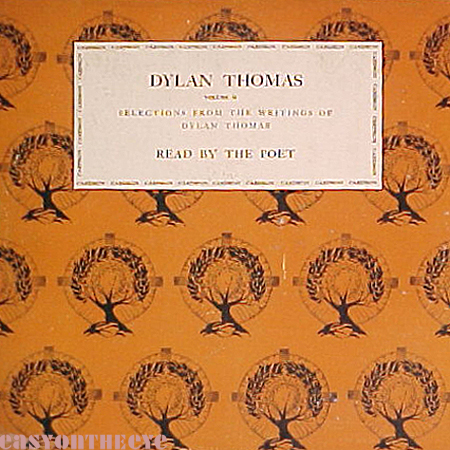 The packaging of their early releases was given over to an art director who settled on a repeated decorative pattern, with a text box for the cover titles (see left). The design was a clear reference to that of book jackets such as the King Penguins, though less skilfully executed. The pattern and colours varied but essentially the sleeves had little individuality. After about 20 releases Barbara and Marianne decided to drop the generic look. Walking past a book shop window they were struck by the eye-catching covers and wanted their albums to stand alongside them. They took over the art direction and commissioned and briefed artists and illustrators from there on. Based in New York they had access to studios, designers and artist’s agencies, and slowly built up a small roster of people whose work they liked (including a young Andy Warhol.) The artists had the freedom to come up with pieces which were of a decent size (bigger than most book jackets) as well as interpret subjects from literature, poetry, drama and history. Caedmon was one of the first record labels to work this way. The ploy worked and the label quickly grew. Unlike music, spoken-word involved relatively low studio costs. Production runs were kept short, with regular repressings (leading to a lot of minor sleeve variations) and the label grew to include double albums, boxed sets of plays including modern productions and older classics. Barbara and Marianne sold the label and catalogue in 1970 but continued to run it for another five years before leaving (to start new businesses in publishing and media.) With well over 500 titles by then the label carried on, and began to seek more commercial releases including science fiction and children’s stories. The sleeve designs began to lose their edge, many recycling existing book covers or using photographs of the narrator. The catalogue remains, now swallowed up by an even bigger publishing company who exploit some of the old material but the legacy of the original packaging had long since disappeared. A book on the label is planned but keeps getting delayed by other projects, so I felt it was worth trying to illustrate the sleeves on-line for now. I’ll leave it up to others to discuss the merits of the recordings. I have spoken to both the founders who have given me invaluable information but would appreciate hearing from anyone with printed catalogues or other memorabilia, and any other collectors of the albums to help me fill gaps. Can you put me down as your first Caedmon book order please I would love this book looking forward to seeing it in print. Blimey!! I reckon I’ve got one of these albums; I’m sure I picked up a second hand copy of J.R.R.Tolkein reading from either The Hobbit or LOTR! I seem to remember he recorded it at home himself, then they issued the recordings on album. Hi Gary; do dig it out and let me know. They are certainly the man himself reading. I have the Tyrone Power album. Can you tell me when it was made? The cover is great. Yes, one of my favourites, so fifties. The best we can do date wise is mid to late 1955 for the first pressing in America. The cover illustration is by Howard Mandel. I was reading this interesting post about Caedmon Records. You mention a book project on the label. Is this still in the works? Yes, it is ongoing, albeit having to take a back seat to other book projects. It may have to appear as a print on demand book if I’m to get it out in the near future! I love these Caedmon records! They’re beautiful and can often be had for a very reasonable price. I just picked up two yesterday. Hi Eric, the pricing on these records is often hit and miss. Some dealers try and really sting you, at other times you can get them very cheap. I’m still working on a full label listing and the former label owner has found a document which she thinks covers everything, so I am trying to interpret. Hello Simon, I have 4 Caedmon records: Ezra Pound (1 & 2), Colette, Albert Camus. If photographs of the covers may be useful to you, I’d be happy to help. All best. I think I have these in the collection Aalam thanks, sorry to take so long replying.